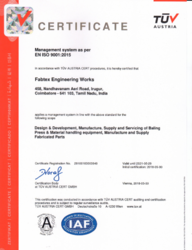 We, "Fabtex Engineering Works" established in the year 1993, are leading manufacturer, importer, trader and exporter of Textile Machines. Our offered extent of products comprises of Hydraulic Bailing Press, Reeling Machine and Honed Tube. These offered machines are used widely because of high wear resistance, little damage for high-speed yarn and low friction coefficient. For more than a decade since its founding, has been using latest technologies to provide advanced machinery to the textile industry that has long been its core business area. known for providing best quality products at most reasonable prices. Our products are manufactured using quality material and also tested various levels for their quality assurance. Further, by providing quality products to clients, we have maintained good tune with our esteem customers. We have a team of experienced professionals who work around the clock for the success and growth of the company. We are backed by fully skilled and experienced team of professionals who manufactured products according to the client’s requirements. For this, they regularly meet the customers to understand their needs completely and then provide them best solution at reasonable rates. Owing to these prospects, we are exporting our qualitative range of products to countries such as Thailand and Bangladesh. Our entire business activities are supervised by Mr. R. Babu. They are the owner of the company. They ensure that every task should be complete in given time frame and we achieve the goal of the company. Both of them have knowledge of the market and years of experience in this domain. For exporting our products to different countries, we have built sound infrastructure. Our manufacturing unit sprawls over a large area of land in Tamil Nadu, India. We have divided our manufacturing unit for the smooth processing. Further, we manufactured products in bulk and store the entire range in spacious warehouse. Our ultra modern infrastructure unit consist all advance tools and latest technology machines. Quality is the major concern of our company and to provide best quality products to customers, we have hired a talented team of quality experts. They manufacture and check each product on the basis of international quality standard and norms. We manufactured world class quality products and strive hard to meet the customer’s requirements. Also, our products are demanded due to their quality so, we export our products to various countries. To provide best quality products to customers, we procured quality raw material from the reliable sources of the market. We are connected with the most reputed and authenticated vendors of the market. Our merchants are known for providing quality material at reasonable rates. Further, with the support of our merchants we are capable to manufactured products in bulk and provide world class quality products to clients. Our team of highly experienced professionals is the most precious property of our company. In our team, we have selected the best professionals of different domains, who hold in-depth knowledge and rich experience in their respective field of operation. Our professionals accomplish their assigned tasks with extreme expertise and competence. Further, our professionals work in close sync with the clients to complete their specific necessities within stipulated time frame. Also, we conduct several training sessions and seminars to keep our professionals abreast with the existing market requirements.